Best Picture From The Royal Wedding! Food Truck Festival + Awesome 80’s Cover Band! Sharks worth more ALIVE than dead. Fancy that..an animal being worth more being alive than dead?! If people would stop killing sharks for their fins, they could essentially make more money in the end by letting them live free without harm in their environment! Sharks are a great incentive (for some) to visit a particular location. Such as: whale sharks in Baja Mexico, and great white sharks in South Africa. If nations are willing to protect these creatures- then they can ultimately benefit from them- up to 2 million dollars in tourist revenue!! My aunt has been diving in Palau- one of the most destined diving spots in the entire world. Although her experience was quite different than most (cliff jumping into the ocean and not quite landing properly and breaking her back), she saw many sharks. Although they are on the top of her “fears” list, believing that one day she will be killed by a shark, she still enjoyed being able to see them naturally (alive) in their environment. In Palau- 80% of their GDP (gross domestic product) comes from shark diving! In 2009, the country was the first to declare ALL of its waters to be a shark sanctuary. Other countries that have caught on are the Honduras and The Maldives. Unfortunately- the International Union for the Conservation of Nature disclosed that 1/3 of open water sharks face extinction. Undoubtedly because of human action-finning, by-catch… Please don’t buy shark-fin soup, or purchase any item with shark in it. You’ll be thanked for your actions in one way or another (like scuba diving and actually SEEING those sharks!). Picture of my friend Nick at the Monterey Bay Aquarium. 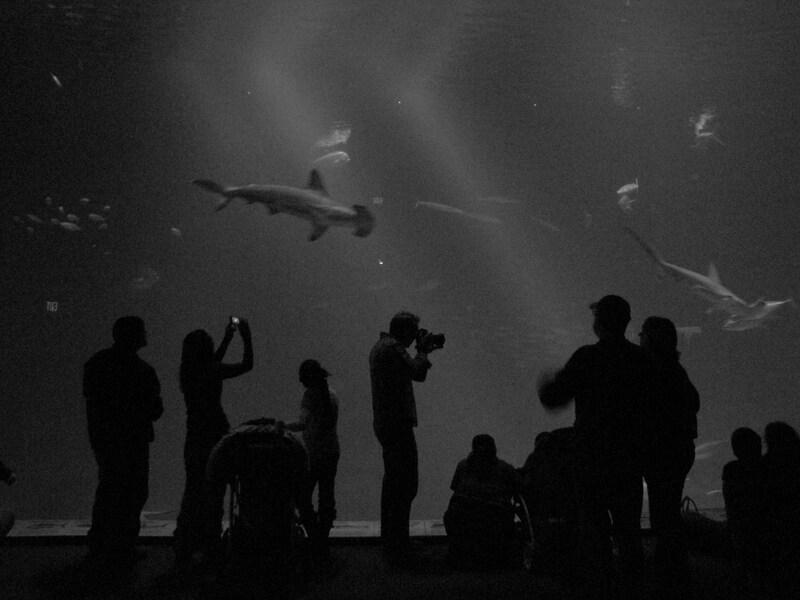 Here is a picture I took last year at the Monterey Bay Aquarium-my friend Nick Kova is in the middle shooting with his camera too. I was playing around with the settings on my camera- and thought that this turned out pretty cool. I love the scalloped hammerheads- they look like they are floating in the air. Another great article, most people don’t know till it’s too late……..